The Mary Nohl Art Environment served the Nohl family, first as a summer home, then served as Mary Nohl's residence until her death. Located on the shore of Lake Michigan in this upscale neighborhood, the site is monitored 24/7 but closed to the public. Mary Nohl was born in 1914, the youngest of three children. Leo Nohl was a noted attorney in Milwaukee. In 1924, he purchased this one and one third acre parcel of land on the shore of Lake Michigan to build a summer home for his family. The land was 45 minutes north of Milwaukee, and the family spent weekends here. Mr. Nohl purchased a prefabricated cottage that was shipped and assembled here. Four years later, he dug a basement beneath it, added a second story and insulated the structure to make it suitable as a year-round dwelling. When she was 12 years old, Mary and her father built the gate posts together, using sand they retrieved from the beach. It was a lesson well learned, and Mary fondly remembered the project. She built her concrete sculptures using sand she also brought up from the beach. Mary helped her father build these gate pillars during her 12th summer. (It is assumed that she added the figures years later.) The sand and rocks were hauled up from the beach in Mary's red wagon. She continued to use that wagon for hauling art materials from the beach over her lifetime. Mary graduated from the Art Institute of Chicago in 1938. She started a career as an art teacher in junior high schools and even ran her own commercial pottery studio for 10 years. Ultimately, she returned home and stayed there. Her mother passed away in 1968, leaving her the home on the shore of Lake Michigan and enough of a fortune to live out her life and pursue her artwork. She created sculptures with concrete, stone and tree trunks. Her whimsical subjects were mystical creatures, fish, children, mythical structures, couples and a miniature Easter Island display comprised of several sculpted heads. If you were fortunate enough to visit this home, you would also groups of stylized figures and architectural structures. Ms. Nohl decorated the outside of her home with colorful panels made with driftwood figures and cut-out wooden silhouettes. 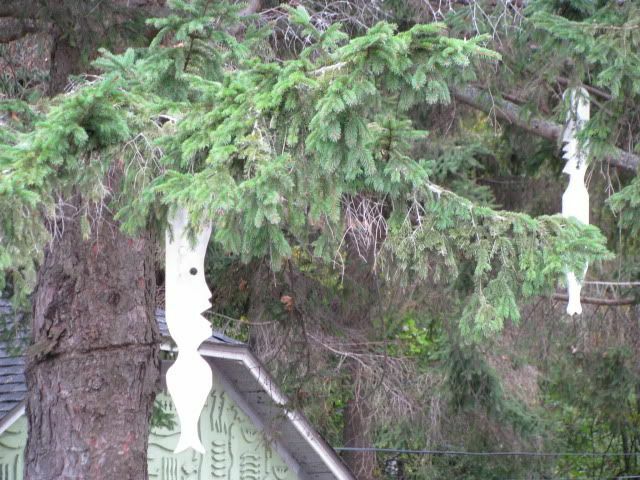 Even more wooden silhouettes dangle from tree branches. Many of the silhouettes were formerly pickets of a fence that she was forced to remove because of damage caused by vandals. Ms. Nohl's reclusive nature and unusual artworks were the subject of numerous urban myths. She was rumored to be a witch ("The Witch of Fox Point") and her home became known as "The Witch's House." Mary took it in stride, even creating a mosaic on her front porch that spells, "BOO!" Her property was the target of many youthful visits, most by the curious, but some visits were from malicious vandals. One of the myths was that Ms. Nohl murdered her family and buried the bodies in her artwork. No matter how many more reasonable explanations were made, the popular culture persisted. The vandalism forced her to put up a chain link fence with barbed wire topping it. Ms. Nohl passed away in 2001. She left her estate to the Greater Milwaukee Foundation. She left her property and all her artwork to the Kohler Foundation. The Kohler Foundation, a friend of the arts itself, restored the above referenced art sites in Wisconsin. Several of the sculptures were removed to the Kohler Foundation facilities for restoration. Local zoning prohibits the property from being opened as a museum, but the Kohler Foundation maintains the site, it is restoring artwork that needs attention and keeps someone at the property at all times. The Greater Milwaukee Foundation used her gift to fund the Mary L. Nohl Fund Fellowships for Individual Artists program, which has two components. A fellowship program provides funds for local artists to create new work or complete work in progress. The "Suitcase Export Fund" helps artists with the costs of exhibitions outside the local region. Since the inception of the fund in 2003 to the time of this writing, 46 fellowships have been awarded. The fund is administered by the Bradley Family Foundation, itself a friend of the arts in Milwaukee. The Wisconsin Preservation Trust lists the Nohl property as one of the ten most endangered sites in Wisconsin. A very vocal minority of Fox Point residents is actively campaigning to have the site demolished, as they consider it an eyesore. Not all residents feel that way and many are proud of the community's unique treasure. 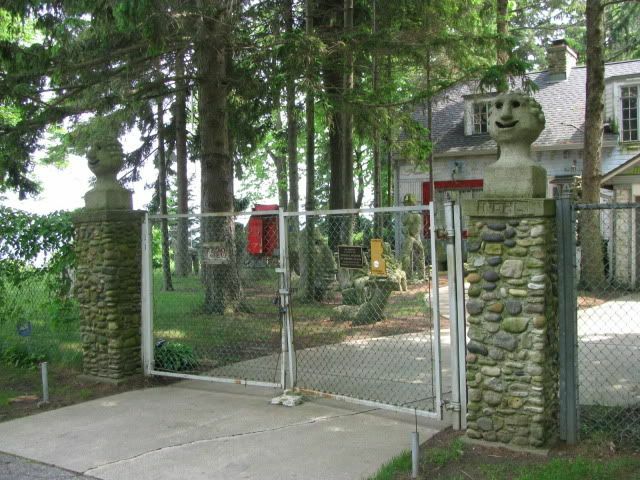 The Trust says that "...without support from within and outside the Village of Fox Point, the Kohler Foundation will be forced to develop an exit strategy and the art and home will have to be removed from the site." Despite the rumors and legends, despite what her neighbors might (or might not) think about her and her home, Mary L. Nohl was a friend of the arts, and dedicated to her work as an artist. She was more than just an artist. Her life was art, and she lived her art. "Mary Nohl Inside & Outside" by Barbara Manger and Janine Smith - Manger and Smith have written this delightful book about Mary Nohl and her legacy of wit, whimsy and art that is embodied in her home and works she left behind. The mystery and magic of her home is captured in these pages from the UW Press.